What I thought about while I was running. Alas, what I’d do without you Sunnto! Now before you say anything; yes, the titles been inspired from the book What I talk about when I talk about running by Haruki Murakami, which by the way is a fabulous read. So on this very pleasant Sunday morning at 4:15 a.m. I set out to attempt my longest run till date. For the avid runner it was a modest 29.7 km distance. I’ll confess I’d aimed to do 35 but a combination of fatigue, lack of a will power after km 28 and my new Asiscs hyperspeed 6 which I was not yet fully used to( having lesser cushioning then the shoes I’ve used in the past and being flat footed, my arches decided to go on a strike). Very well maybe next time. So, at approximately 4;15 a.m. I left my house. Just 600 meters into the run I land up bumping into this group of people who were probably returning from a party somewhere. I’m quite certain they looked at me with curiosity! What creature runs the streets this early, that to on a Sunday morning? Given my running routine in the last few months I was equally amazed to see them. So I ran on, thinking how unthinkable this would have been for me a year back attempting to run at 4:15 on a Sunday morning. How life changes! As I was running along, seeing a number of stray dogs fast asleep my mind drifted to the comfort of my own bed. “When will this insanity stop? Normal people sleep in on Sunday mornings!”. Another part of my brain promptly replied, ” I’m really hoping never!”. See once you’ve tasted a better life, one where your fitter, you don’t really want to go back. I’ve been moving forward in my short life as a runner with this amazing momentum. I reminded myself of a line I heard on a Nike commercial that momentum is a cruel mistress who could turn on a dime with the smallest mistake, ever searching for that weak place in your Armour. I knew if I give in to comfort now, It’s only gonna get tougher the next time. So I’m nearing Sion now, roughly 9 km into my run. See I planned a route, so that I’d pass by the one place I visited nearly everyday for the past 6 years, Medical school! Now I knew running to medical school was no big thing for me now. It’s 14 kms away and that’s a distance I’m quite comfortable with. But in the past, with the Mumbai traffic and my sheer lack of running ability, the notion of running there seemed absolutely ridiculous. Ha, I was so wrong. I’ve graduated from med school 6 months ago and it felt nice to pass by a place I was so familiar with yet it seemed so alien today. All the times, taking a good 45 mins to get there, rushing through the traffic, honking my way, struggling to reach the wards before my unit head got there. Who knew this was all a run away. Quite comfortable at this stage, I thought I’d be able to do a full marathon distance. Experience has taught me, how quickly comfort turns to sheer agony, running with amazing speed can turn to laboring on nothing more than will power very quickly. Baby steps I told myself. Lets get to 21 km first. My last half marathon taught me the ill effects of overhydration and the relative hyponatremia(low sodium) it can cause. I had a 500 ml bottle of water in my hand, which was starting to run out and I was determined to make it last till 21 km. So nearing 25 km, pretty exhausted and my feet cursing me. I dropped to 7 min/km pace. All that mattered today was putting one foot forward after another. Speed was the last thing I cared about. At 26 km my dreams of a 42.2 km distance were drifting far away. The last 3 km I ran were by far the toughest I’ve run. I used every trick I had to keep moving. Motivational books( I remembered the chapter “pain only hurts” from Eat and Run by Scott Jurek). Even the Rocky Balboa scene popped in my head. I imagined Rocky screaming at me “It aint about hard you can hit, It’s about how hard you can get hit and keep moving forward, how much you can take and keep moving forward!”. Even a wonderful blog by Amit Sheth titled “men in boat” came up. 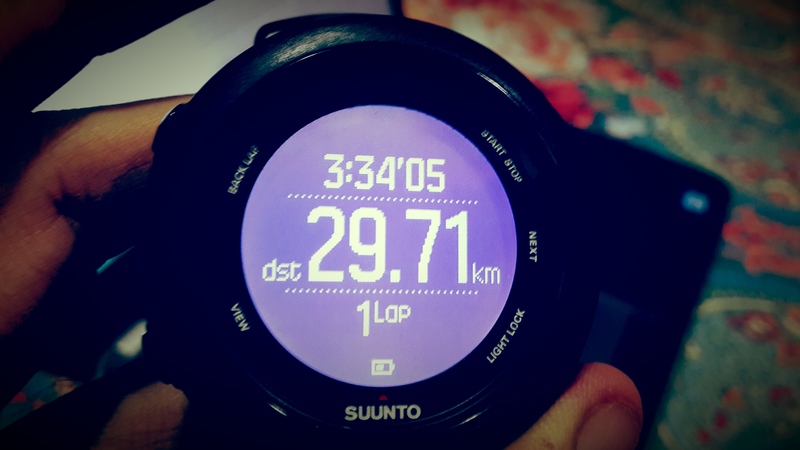 But at 29.7 km, my mind gave up. I rarely say my body gave up. It’s usually always the mind that caves in long before your body does. Don’t get me wrong I’m super proud of my run. It’s the longest distance I’ve covered. 8 months back when I started running I had mustered a huge 100 meters. Today I’ve run 29.7 km. Not to mention how much thinner and fitter I am. But as the saying goes “yeah dil mange more”(the heart wants more). Sitting here writing this, the feeling of my aching muscles gives a weird sense of pleasure only long distance runners would understand. I fear the day I’ve reached my maximum. But then again that’s a myth. There always no pace too fast and no distance too long to conquer, right? With people out there doing a full marathon in just over 2 hours, I can always get better. I leave with a quote from arguably one of the greatest marathon runners, Emil Zatopek ” To boast of a performance which I cannot beat is merely stupid vanity. And if I can beat it, that means there is nothing special about it. What has passed is already finished with. What I find more interesting is what is still to come.” Happy Sunday to you!